Gluten Free | Keto One Day At a Time. Although this Baked Chicken Parmesan has several steps, it is still a lot easier then traditional Baked Chicken Parmesan. What I love most about this recipe is it is Gluten Free, so I get to enjoy it with my family. The morning or the night before serving, combine Italian dressing, ranch dressing, 3 tablespoons minced garlic and 2 tablespoons olive oil in a large zip lock bag. Squish bag around to combine all ingredients. Add chicken breasts to bag, close and squish until they are well coated in the dressing mixture. Put the bag in bowl (to prevent spills) and refrigerate all day or overnight up 24 hours. When ready to cook, Preheat oven to 400*F. Then mix 2 cups Parmesan cheese, with parsley, 1 1/2 tablespoons of the basil and oregano (each). Spray a large baking dish (big enough for all six breasts) with olive oil cooking spray. Remove chicken from baggie one by one and “dredge” in the cheese and spice mixture, until thoroughly coated in cheese mixture. Then place chicken in a single layer in the dish. When all chicken is coated, place chicken in oven and bake for 20-25 minutes (or until the internal temp is 155*F). While chicken bakes, in a large non stick sauce pan, make the sauce. Spray sauce pan with olive oil cooking spray (or use 1 tablespoon olive oil but do not use another flavor spray). Then saute onions and remaining garlic until tender and onions are translucent. Add tomato paste and tomato sauce to garlic and onions. Stir until smooth. Then add the remaining, oregano and basil and the other spices including the bay leaf. ( if sauce looks to thick for your liking add 1 tomato sauce can of water) Allow to simmer for the remainder of the baking time until you need it. 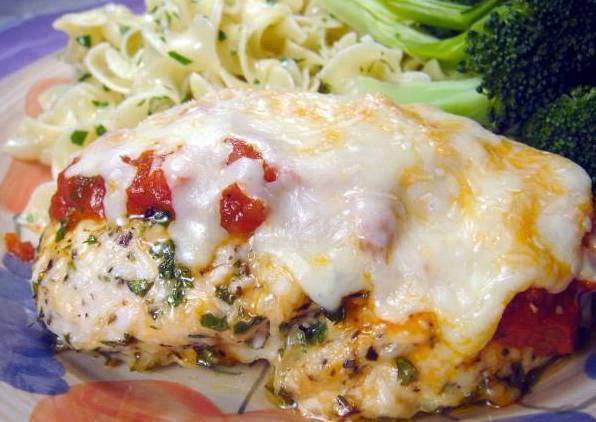 When chicken has baked 20 minutes, remove from oven and top each breast with sauce, Cover the whole thing, then top with 1/4 cup of mozzarella cheese, put baking dish back into the oven for 10 more minutes or until cheese is bubbly. Then switch your broiler on to brown cheese (optional). Remove from oven and sprinkle with remaining Parmesan cheese. I usually serve my Baked Chicken Parmesan with some Gluten Free Penne Noodles (Barilla Makes the best) I just add a little butter, garlic and add some grated Parmesan. But you can certainly pick the side dish your family will love most.